If you’re completely and utterly confused about which web host provider to use for your WordPress blog or website in 2018, this comparison post has got you covered. I’m not really one for writing reviews about web hosting companies, however, in my time online I’ve used quite a few of them, and mostly the popular ones. So, here is my full comparison review of three web host providers that I have used in the last five years. Finding the right hosting provider for your needs is important. Yes, there are quite a few companies out there to choose from, which makes the task of finding the right one even more stressful. If you’re new to building websites and web hosting, don’t be alarmed by it all as it’s really not that hard to pick a really great web host provider. If you’re looking to install WordPress using a reliable web host, do check out my setup guide here. OK, so when choosing the right web host for the job, you’re really looking for three critical things. I’ve put ‘affordability’ at the bottom for a reason. That reason simply being that I see so many folks starting online looking for the cheapest options available. You’ve heard the phrase, you get what you pay for, right? Well, sometimes it pays to pay a little more, especially if you want to get the best possible service for your website. Moreover, if you’re trying to build a personal brand or small business, you don’t want to start with the ‘cheap’ mindset. By the way, I wrote a detailed post here if you want to learn how to find the best hosting provider for your blog or website. It outlines and explains the 7 questions you need to ask yourself when looking for a reliable web host provider. And the three most popular web host providers are right now? Bluehost, HostGator and SiteGround as far as I’m concerned. HostGator and Bluehost are household names in the web hosting world. SiteGround is also extremely popular. Bluehost and SiteGround are currently WordPress’s top choice for PHP and MySQL web hosting. 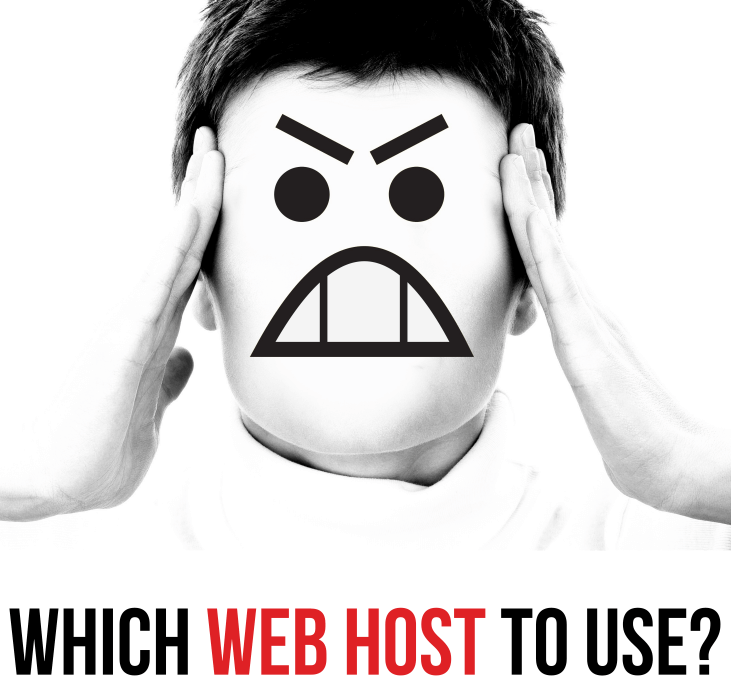 Which web host to use??? Or, what is, in my opinion, the most reliable, secure, and affordable web host provider? Hopefully, after you’ve read through my comparison post here, much of it based on my own personal experiences with these three hosting companies, you’ll be able to make a better decision as to which hosting company to use for your website or blog project. Before we get started, I want to explain the situation with Bluehost and HostGator quickly, which I think you should know about if you don’t already. As I mentioned, HostGator and Bluehost are common household names in the world of shared web hosting. Both of these companies are also divisions of a much larger corporation. Bluehost and HostGator are owned by the EIG Group (Endurance International Group). What does that have to do with anything? you might ask. Well, for the folks who have experienced any ‘below average service’ from an EIG owned hosting company, it can be an instant turn-off for new customers. Because EIG also owns over sixty other hosting brands, some of them are good, most of them pretty bad sadly. And, that’s not just my word or opinion either. Just go ahead and do a quick search online and you’ll soon find an abundance of complaints made by customers using an EIG hosting brand. I want to be honest with you, this is why I’m telling you this right off the bat. Whilst both Bluehost and HostGator are separate companies offering different levels of services and prices, they’re both owned by the same mothership hosting company (EIG), so please consider this for the future. SiteGround, on the other hand, is a completely independent hosting company. They haven’t been around for as long as the two above mentioned companies, granted, but they are certainly a web host provider with a huge amount of credibility. Over the years they have gained an enormous amount of popularity, respect, and authority, and they’re certainly one of the best choices to consider. OK, so now let’s dive deeper into each of these three popular WordPress web host providers. Rather than just talk about features alone, I’ll try and share with you the benefits of using each hosting service provider listed below. Let me start with Bluehost, only because I’ve had over 5 years experience with using them. I actually started my blogging venture with Bluehost back in 2010. It was one of the recommended hosting sites on the WordPress.org site, and it still is today. Services Offered – Bluehost offers domains, shared hosting packages, cloud hosting, VPS hosting, dedicated hosting, WooCommerce hosting, and WordPress hosting with one-click installation feature. Reliability & Security – So this is the part you need to read about. When I began using Bluehost back in 2009, they were without a doubt incredibly reliable. Easily the best in the business I might add. Uptime was really good too. The first couple of years I experienced only 1 downtime, and that was when the company decided to install some new upgrades, but nothing much to complain about. From around 2013 and onwards, uptime and the general quality of the service I received from Bluehost became something of an issue. In the final year of using Bluehost for web hosting, myself including many other customers of Bluehost were experiencing very frequent and prolonged durations of downtimes. On 1st April 2014, my website experienced downtime for 3 whole days, with actually no real explanation from Bluehost other than they knew about the problem and was trying to fix whatever issue was going on. Many other customers were experiencing the same downtime issue, however, I can’t speak for them, I know. That became the normal thing afterward, to be honest, they were frequently trying to solve some kind of downtime problem. I used this tool to calculate the uptime I was experiencing from Bluehost over a 12 month period, minus all the downtimes. 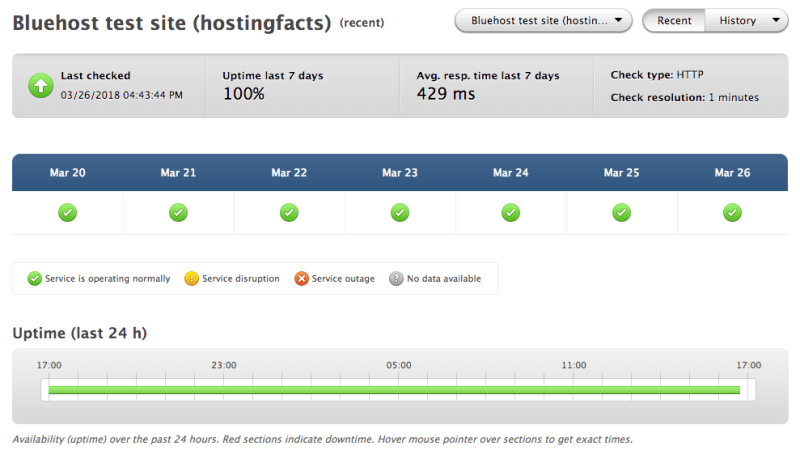 It turned out that my site was experiencing an uptime score of 99.20%. Most people would argue, well, that’s not too bad surely. Well, consider this, I’ve been with SiteGround for coming up to 4 years now, and I’ve yet to experience my website going down with them. 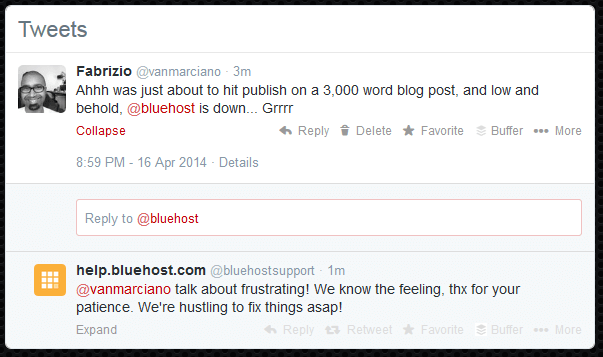 On April 16th, 2014 my website went down again with downtime, I sent out a tweet about it and mentioned @bluehost. As normal, they were working on it, and folks, that was the last straw for me. Shortly after, I began looking for a web host company. Asides from downtime, what else was wrong with Bluehost? 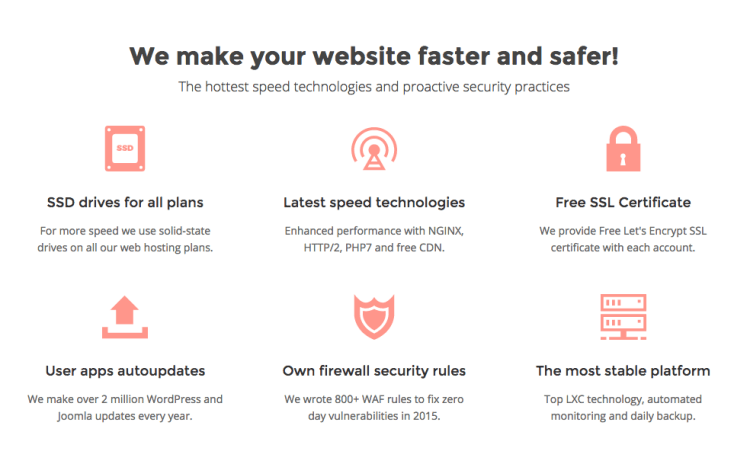 When it comes to security, Bluehost is still pretty solid in my opinion. In my time using them, I’ve only experienced one occasion where an attempt was actually being made to hack into my site, which I guess really doesn’t have anything to do with Bluehost. Luckily the Bluehost tech team were on the case before I could even bring it to their attention. **View Bluehost page load speed and uptime for the last 8 months here. Affordability – Bluehost is not the cheapest around, but still nevertheless reasonably affordable when you weigh up what you get. According to their website, what you get is unmetered and unlimited everything. Shared hosting starts from $7.99 per month ($3.99 with their current 2018 special offer) for a Basic plan, whilst their Prime plan will set you back $14.99 per month ($5.95 with their current 2018 special offer). If you’re just starting out, then the basic plan will be ample enough for you. Customer service and technical support – On all the occasions that I’ve used Bluehost customer service, they have been very responsive, well mannered, and ready to assist. They answer chat requests fairly quickly and are pretty good at solving small issues and minor technical problems. I found, however, that the more technical the issue was for the Bluehost team, they would struggle to resolve a problem. On one occasion I remember, I was experiencing some problems with my site CPU throttling my hosting account. The only option Bluehost had to offer me at the time was to upgrade and pay more money for a VPS plan. They insisted in fact. I later learned, when I migrated over to SiteGround, that I didn’t actually need a VPS plan at all. All I had to do was optimize my site, delete a few plugins and clean up my database. I thought that was pretty cheeky from Bluehost. Bluehost offers 24/7 support via live chat, support ticket, and telephone. They also use Twitter to provide help and support. Facts and stats about Bluehost – Here are some interesting things I found about Bluehost. Bluehost hosts over 2% of all the domain names in use on the internet. – Source. 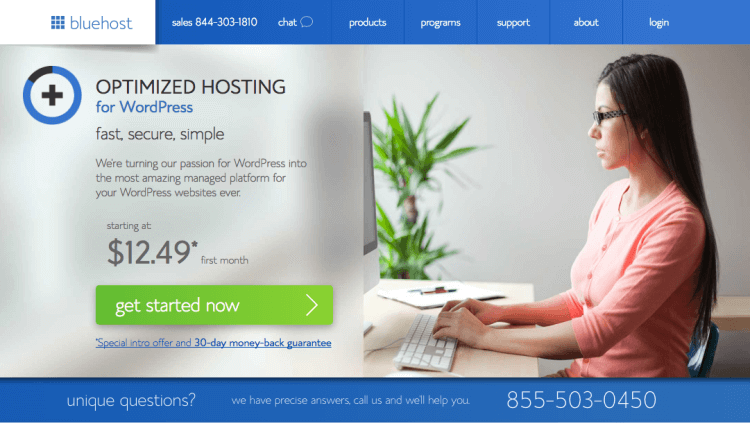 Bluehost powers over 2 million websites worldwide. Bluehost has 73% positive user sentiment – Source. Final words – Despite being a popular web host provider, and based on my personal experience with them over the five years, Bluehost are not the best in the business, and again, that’s my personal opinion. They’re not the worst either. I would recommend Bluehost to anyone starting out for the first time, but I wouldn’t recommend anyone upgrade to them from another hosting provider. With a brand new website, you can’t really go wrong with Bluehost. If you have a much larger site or blog, however, I’d be reluctant to recommend using them as a primary host provider. All that being said guys and dolls, I haven’t used Bluehost since 2016 now, and who knows, perhaps they have improved, perhaps they haven’t. I give Bluehost a respectable score of 3.6 out of 5.0. A bit more if it wasn’t for the frequent downtimes that I personally experienced during my time with them. If you want to give Bluehost a try for your WordPress website hosting, click here to get started. (Disclaimer is located below this post). OK, so I’ve not used HostGator for as long as I’ve used Bluehost, I want to get that off my chest first. I started a second blog project way back in 2011 called Online Income Journal, which was, of course, hosted on HostGator’s Hatchling Plan. This was just a small personal blog project that really only lasted for about a year before I decided to kill it off. It didn’t have much in the way of traffic either, around 20 visits per day at most. During my short time with HostGator, I did experience a very good all-around service. Services offered – HostGator offers shared hosting, cloud hosting, dedicated WordPress hosting, VPS and dedicated servers and domain names. Reliability – Even though I was a customer of HostGator for only about 16 months, I was quite impressed with the reliability of their service. I experienced zero downtime with my site during its short life, and so never really had the chance to use and experience their customer support properly. The signup process was fairly straightforward with HostGator, that I will say. And, once you’re in, you have access to a similar setup as with Bluehost, with cPanel and smart web developing tools, and of course that one-click install feature for first-time WordPress users. 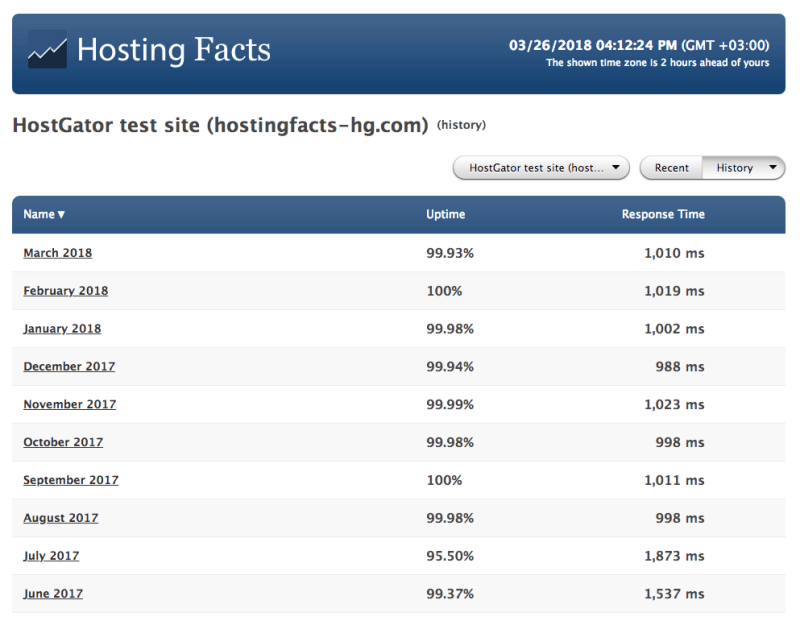 **View HostGator page load speed and uptime for the last 8 months here. Affordability – HostGator is one of the most affordable web host providers around. Their prices start from $3.95 per month for a Hatchling Plan for shared hosting on a 36-month plan. There’s also a Baby Plan and a Business Plan as well, all with unmetered bandwidth. In addition to already being cost-effective, HostGator frequently hosts special offers throughout the year. Customer service and technical support – As I said I’ve never had to contact customer support regarding their service or any issues with my personal blog project. That being said, HostGator offers support via Live Chat, phone or fax. You can also write to them directly using conventional mail should you wish. Facts and stats about HostGator – Here are some interesting facts about HostGator. HostGator was given the Best Customer Service award in 2010. Source. 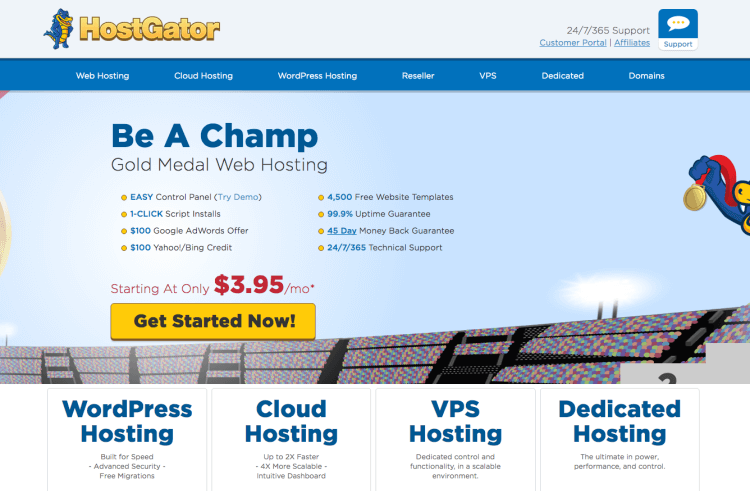 HostGator was given the Best Small Business Hosting award in 2011. Source. Final words – Just to be clear once again, I haven’t been a customer of HostGator for long enough to really score them properly. I’ve heard mixed feelings about the quality of the service they provide over the years from people I have connected with in my blog community. However, from my short time with them, HostGator have been a great host and I would recommend them to anyone starting out with a small website or personal blog project. I give HostGator a respectable 4.2 out of 5.0. So we come around to SiteGround. SiteGround is the hosting provider which I’m currently using for Magnet4Blogging, and I have been since May of 2014. I switched from Bluehost as I mentioned earlier. So this is how SiteGround got onto my radar, it’s really quite interesting, well I think anyway. Someone at SiteGround had noticed my mention on Twitter about my frustration with Bluehost and downtimes, and what they did was sympathize with me and offered me a better option. After a quick friendly chat with one of their sales team member, I ended up signing up for 12 months contract with SiteGround, and they even migrated my site over for me all within a day. Services offered – SiteGround offers shared, cloud and reseller hosting, dedicated servers and domain names, website migration. On their shared hosting plan they offer three tiers. StartUp, GrowBig, and GoGeek. Currently, I am on a GoGeek myself, however, if you’re developing your blog or website from complete scratch, the StartUp plan will give you plenty enough resources. 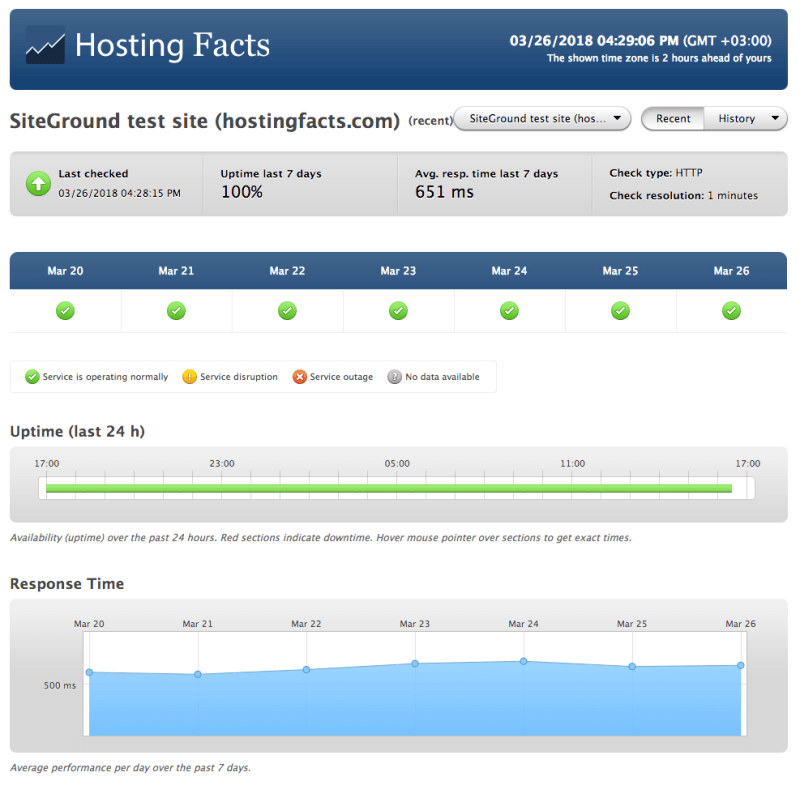 Reliability – SiteGround claims to provide 99.9 percent server uptime on their website. Well, I’m happy to report, however, that in the last 4 years of using them, I’ve actually experienced 100 percent server uptime! **View SiteGround page load speed and uptime for the last 8 months here. 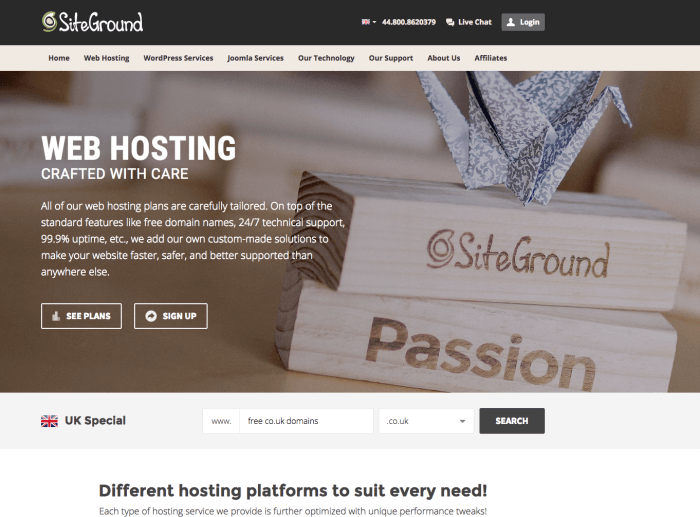 Affordability – SiteGround, again like Bluehost isn’t the cheapest web host providers on the web. But, what is affordable or cheap to one person is completely another thing for someone else, right? Like I said, you’re either willing to pay peanuts for a poor service, or a higher premium for a more reliable service. And I know that sometimes you can pay MORE and expect a reliable service, but actually, end up getting rubbish service. The StartUp plan with SiteGround will set you back $9.95 per month (Currently there’s 60% off deal with SiteGround, which means you pay only $3.95 per month) for a 12 month period. The Grow Big plan will set you back $14.95 per month (Current offer is $5.95 per month), and the GoGeek plan will set you back $29.95 per month (Current offer is $11.95). Click here to learn about the latest SiteGround Sale deals. Customer service and technical support – SiteGround provides customer service and technical support through means of phone, chat or ticket. The reason for contacting them was regarding CPU throttling problems that I was experiencing on my account at the time. What they did was help me to identify where the problem was coming from, although they didn’t succeed in finding a solution. I was later able to identify a simple setting in the WP theme I was using at the time, which was causing the high CPU throttling. I give SiteGround customer team and technical support a big thumbs up, simply for the fact that they were willing to help me out before telling me that I needed to pay more money for improved service. With SiteGround you also get access to a host of resources, including tutorial videos, webinars and there’s even a setup wizard for new folks. Facts and stats about SiteGround – Here are some interesting stats about SiteGround. SiteGround have data centers in three Continents. USA, Europe, and Asia. From my own findings, I’ve managed to achieve 100% uptime from SiteGround in the last 48 months. Woop, Woop! Final words – I’ll remind you that SiteGround isn’t a cheap option, and if you join them at a discounted rate, don’t expect that discount to continue through when you renew your hosting service with them in a year’s time. I certainly noticed how my hosting bill went up by a whopping $80 in the second year. That being said guys and dolls, I recommend them wholeheartedly! If you don’t mind paying a little extra more for peace of mind and reliable web hosting, then get with SiteGround. Let them take care of hosting your site securely so that you can get on with what’s more important, building your blog or online business. I personally give SiteGround a respectable 4.8 out of 5. Whether you choose to use a household name web hosting company like Bluehost, or an independent company like SiteGround to host your WordPress website, there are a few things you have to keep in mind as I’ve outlined in this post. Don’t just go for the cheapest option and be done with it, and don’t go for the most popular provider because that’s what everyone else is doing. Consider your options carefully. Do your research carefully, hopefully, this post will have helped you a little bit. Weigh out the facts and stats before finalizing on which host provider to use for your future website or blog project. I hope you’ve enjoyed reading through this web hosting comparison post, and that you’ve found it useful. If you have any questions, please don’t hesitate to ask me in the comment section below, or drop me an email here. Affiliate Disclaimer: Some of the links in this review post are affiliate links. If you choose to use any of the affiliate links above to purchase web hosting, I will be paid a small commission in return, at no additional cost to you. I want to thank you in advance for your continued support as this helps me to ensure that Magne4Blogging continues to provide you with great value. I am sure I am not the only one that appreciates such a honest review. Sadly as we know, most hosting “reviews” are glowing because they are written by affiliates only wanting to earn commissions. I used Hostgator for many years and was very happy with them. That was until, as you mentioned, they were bought out by EIG. Obviously the big problem is that EIG moves hosting companies they acquire to their own server farms and their own support systems. Had all kinds of problems after the new owners took over. I tried sticking out with them, but wasn’t worth it. I switched to a new host and couldn’t be happier. So nice to have a host that knows their business. Maybe hostgator has gotten better. Just wasn’t for me any more. Keep up with honest approach Fabrizio, we appreciate it!